For a new, occasional Cat Friday series, we're highlighting the importance of fostering shelter animals. The series intends to show why fostering can be a joyful, fulfilling responsibility that not only saves lives, but also enriches the lives of foster volunteers. This series will feature Q&A-style interviews with (mostly) cat foster-parents, from first-time to very experienced fosters. As we continue to feature local foster parents’ experiences for CF, the ultimate goal is to inspire others to take on the commitment too, but with a clear understanding of what it takes and what can be gained from the experience. Our first guest featured in the debut of “Why I Foster” is Libby Forsyth, who lives in Nine Mile Falls and works at WSU Spokane. As a disclaimer, I personally know Libby and her family, and admire their deep commitment to fostering. Thus I asked her to be our first guest in the series to help it get off the ground. Future series installments will seek to profile foster volunteers with all of the Inland Northwest’s various animal welfare and rescue groups. If you are or know of a local foster parent who’d be a good fit for the “Why I Foster” series, email your nomination to cheys@inlander.com. What is your name, occupation and a brief description of your living situation? I’m Libby Forsyth and I am the Program Assistant for the Health Policy and Administration Department at WSU Spokane. Go Cougs! I live in the Nine Mile Falls area with my husband Greg of 30+ years and our son, Ian, who is home from college for the summer. We have three “full-time” cats of our own: Harvey, Piper and Clipper, the last of which I bottle fed and raised from about a week old, and he just turned 17! How many foster litters or individual animals have you fostered? I’ve fostered about three litters a year for the past three years during “kitten season.” Typically, I get the litters when the kittens are a week or two old and they have ranged from three to six per litter. I did have one litter of six without a mother. Thankfully, our son was home from college for the summer and was a huge help — I could not have done it on my own. These kittens are really needy and require a lot of time and extra love. With a resident mom, it’s really not a lot of work. On busy days, I just check on them morning and night to make sure they are healthy and have food and water. This mama cat and her litter of six stayed with the Forsyths back in April 2012 until the kittens were old enough to be adopted out. That's Harvey in the bottom right. For which local shelters/rescue organization do you foster? Spokane Humane Society, (find out how to become a foster for SHS) although I think all the local shelters cooperate with each other and get the animals the best placement possible. When and why did you decide to become a foster parent? It was something that I’d thought about for years, but then our daughter, Ali, graduated from college, got a job (and a cat) and moved out. Her room was a typical teenager’s room with mascara, marker and glitter stains on the carpet so it was a perfect environment for fostering without worrying about pet-related damage. It was a place where the mama cat and kittens could feel safe but segregated from our own cats so none of them would feel that their territory had been encroached upon. What are the most rewarding or fulfilling moments of being a foster parent? What are the most challenging or emotional parts of the responsibility? The most rewarding part is knowing I’m helping to raise someone’s beloved pet! At the same time, I worry about them going to responsible and loving pet owners. Another challenge is seeing these sweet mama cats that have been surrendered. 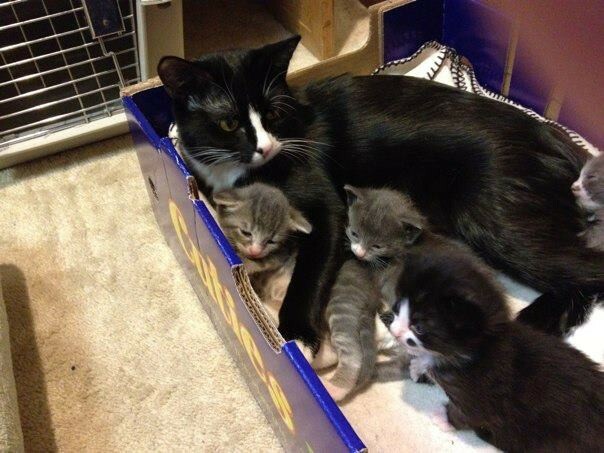 My current foster mom was only about 8 months old when she delivered six kittens, two of which were stillborn. The people that turned her in claimed she could open doors and let herself out, and that’s how she became pregnant. (This cat has never even jumped at a doorknob in my house.) Oh, and they surrendered her mother at the same time and she was also pregnant. Neuter your pets, people. Do you try and find your fosters homes before they’re ready to be adopted out? For the most part, I entrust the adoption process to SHS. They are awesome at outreach and finding homes for these cats. I think they do a wonderful job getting the word out to the community about available animals. However, my circle of friends and acquaintances are very aware of my fostering, so they know to send potential adopters my way. Do you try and keep in touch with any of your fosters' adopters? I can think of a few in particular. Our daughter’s best friend, Hayley Graham, adopted a beautiful sweet girl named Blair. My elderly mother’s life has been very enriched with the addition of one of my mama kitties to her home. A man who had a tough year after a divorce adopted a kitten and later told me the kitten made him laugh more than he had in a long time. Harvey as a foster baby and Harvey today, at 2 years old. I adopted a kitten from my first foster litter, Harvey. When I walked in the room, he was the first kitten to greet me and purr enthusiastically. Believe me, he wasn’t the cutest kitten, but has grown into a beautiful cat. I’ve learned over the years that personality and a common bond is much more important than cuteness, gender or color when you are choosing a pet. How has fostering impacted the other people (and pets) in your life? I’ve been the most surprised by how many of my 21-year-old son’s friends enjoy playing with the kittens. You see these big guys cradling a tiny kitten and it just makes you smile. My husband “tolerates” it because he knows how much I enjoy it, but I have also caught him sneaking in to visit the kittens when he thinks I’m not around. 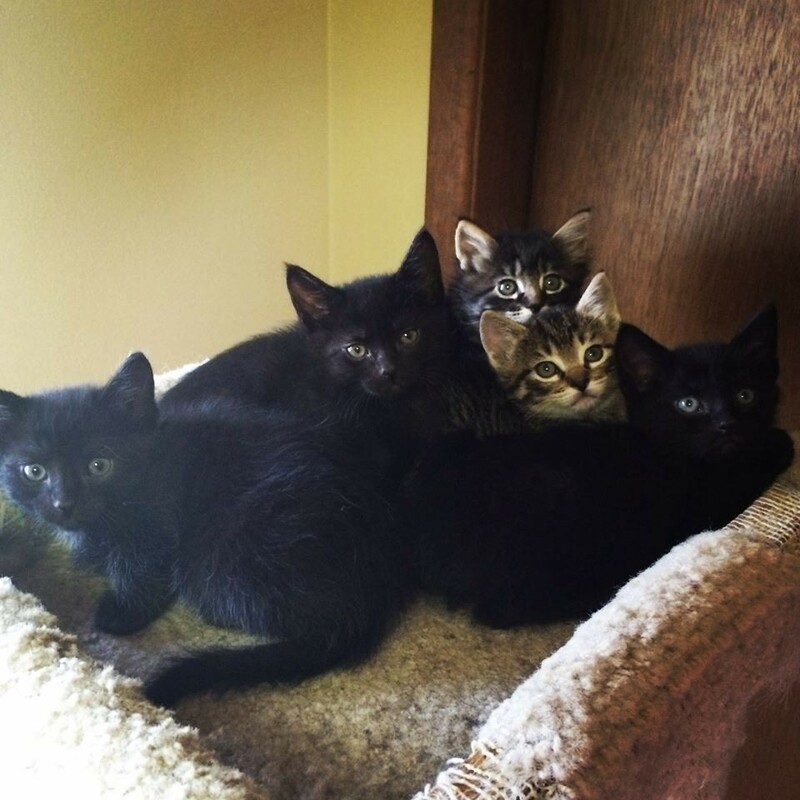 These five foster kittens took over a room at the Forsyths' earlier this spring. How much of your own resources have you invested in fostering? I generally get a large bag of food and litter from the Spokane Humane Society when I pick the kittens up, and then provide the rest on my own when the initial supply runs out. The biggest expense is cat litter! What have you personally gained from volunteering as a foster parent? It’s very rewarding! Plus I think it’s a lot like being a grandparent, from what I have heard. You get to cuddle and nurture these little babies and then hand them off to a good home at the end of the day. Looking back, what is one thing you wish you had known about fostering when you brought in your first litter? Their room can get pretty stinky, and they go through a ton of cat litter when the kittens start using the litter box! Any last thoughts on the fostering process you want to emphasize? Kittens that are fostered are usually much more socialized, and the foster parents are a great resource to get an idea of a kitten’s personality and how it will fit into your home.